EDITED 4/14/2018: Well, this is awkward…. Weeks after writing this post, based on photos identified by my late Aunt Dot, I finally located information about when my Great Aunt Cora and her sister Laura died. Cora, Mrs. McGarvey, died on December 31, 1924. Laura, the city librarian, died in an automobile collision in 1936. That means that the woman in glasses in this photo, whom I identified as Cora, is actually Laura. Cora [Laura], an unknown man, and Alice, in the 1930s. So it was Laura who wore short skirts in the 1920s, and horn-rimmed glasses, and worked outside the home for most of her life. Cora was not the merry — or at least, cheerful — widow that I thought she was. It was Laura who took road trips and adapted to changing fashions as shown in these photos. EDIT 4/17/18: Beyond this point — beware of unreliable identifications and deductions regarding Cora! Left, my Great Aunt Alice; right, her older sister, Cora. Early 1900s. The unexpected bow in Cora’s hair may be an early indication of her un-stodgy fashion sense. As I try to sort family photos, I am also trying to sort out their stories. At dinner last night, my husband gave me a strange look and said, “It’s hard to realize that you knew people born in 1875.” Well, I only knew them insofar as a child can know an adult, but I have vivid memories of my Aunt Alice in her seventies, still witty and clever. I wish I had known her older sisters, Cora and Laura. Cora was the eldest, born in 1867. In 1920, she sent this old portrait photo of herself to her niece Dorothy, nicknamed “Sister” or “Sis” because she came along after two brothers. The back says, “To Sister, from Aunt Cora, July 1, 1920,” but the hair style is much earlier. Cora as a young woman; there is a pretty jeweled comb or hairpin in her bun. [Probably] Cora — who became Mrs. William McGarvey in 1896 — sitting on a porch hammock; probably early 1900’s. She is wearing a shirtwaist with a collar that could accommodate a mannish, detachable stiff collar. They often appear on turn-of-the-century American women drawn by Charles Dana Gibson. And she looks very sad. Cora Barton McGarvey [EDIT: or this could be Laura….] in a shirtwaist blouse. I don’t have the expertise to date it precisely. This is one of the few pictures in which she looks like the eldest of the three sisters. EDIT 4/17/18: Anything about Cora from this point on is suspect; she was married to Mr. McGarvey; the 1900 census information is correct; but she is not the woman identified as Cora in these photos. I can’t say that her marriage was an unhappy one, but, as you will see, widowhood seemed to suit her. In the 1900 census, her two adult sisters were living at the same address as the McGarveys. William McGarvey, accountant, was listed as head of household, Cora as wife, and her sisters Laura and Alice as “servants.” There was one male “servant” or farmworker, and no mention of children. Cora’s husband died in 1918. At 54, Cora [no, Laura], top left, looks quite fresh and modern in her checked dress in this photo from 1921. Her youngest sister, Alice, is holding their baby nephew. Do Cora and Laura [No, Cora] (in sweater) have cropped hair? It’s more likely that they have just cut bangs. From this point on, Cora [Laura] wears glasses — and not “old lady” wire-rimmed glasses — “modern-in-the-twenties” horn rims. Cora [No, Laura] eating watermelon on a road-trip vacation, 1920s. The Barton sisters wearing the “pouter pigeon” look of the S-Bend era, probably before 1910. Left, Alice (b. 1875;) center, their sister-in-law, also born in 1875; and right, Cora, born in 1867 [EDIT: It is Laura, born in 1869.] These “late Victorian” women have all adopted short skirts and bobbed hair during the 1920’s. And they kept right on wearing up-to-date clothing. Here, they have even adopted sleeveless dresses — these women who grew up wearing high collars, long sleeves, and floor length skirts. They looked like they were having a good time on that vacation with my mother…. Cora [No, Laura], on the left, enjoying watermelon from a roadside stand, 1920’s. Cora/ Laura almost seems to be flirting with the camera. My mother is on the right. I wish I’d known her. P.S. If the story of fashion for older women interests you, be sure to visit the American Age Fashion blog. This vintage dress has been altered and patched. It raises many questions. The patches on this faded dress hint at a life of hardship. If I had photographed the back, dating it might be possible — but a poor woman might not have had access to current fashions. It’s a mystery to me. Many collectors are interested in the beauty of vintage dresses. But the woman who collected these dresses saw them as windows into women’s lives. Sadly, neither dress had documentation, so we don’t know anything about the women who made them, wore them, patched them, and tried to make them last a few more months or years. I’m sharing them because such dresses rarely survive to be collected — they end in the rag bag, not a museum. I don’t have the expertise even to date them securely (and how I wish I had had time to take more pictures!) Comments and conjectures about them are very welcome. A mystery dress circa 1930? Back of red dotted dress with a puzzling insert at the waist. Is this a late twenties dress, lengthened as much as possible for the 1930s? Or is it a thirties dress, lengthened and altered for a new wearer? It is very long, suggesting early 1930s. There’s no fading to mark a previously shorter hem line, but this hem is as skimpy as possible. Was it a hand-me-down from a shorter woman? The rolled hem on this collar is machine stitched, but quite uneven. Maintaining even tension around the curve of a soft, sheer material isn’t easy. Someone who worked on this dress didn’t cut perfectly on grain, so the skirt sags towards its right side. You can see that the vertical pattern of dots on the front of the dress lined up originally. Was there always a waist seam? It doesn’t look like it. The slightest sag at the waist seam (the dots don’t line up evenly) affects the hang of the skirt. Did this happen originally, or when the wide piece was inserted? Was the front of this dress one piece from shoulder to hem before it was altered? The pattern of dots isn’t straight because the skirt is off grain at the waist. 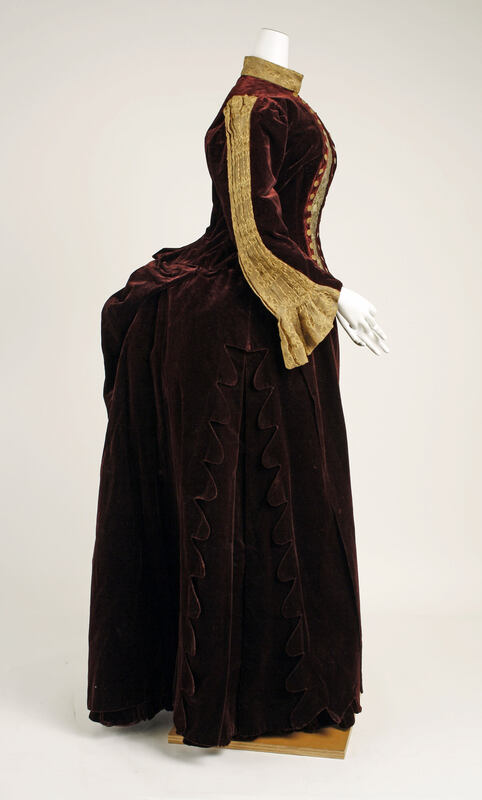 Vertical back seams suggest that the dress always had a waist seam in back — or do they? I’m asking…. Again, this pattern matching is not the work of an experienced dressmaker. On the other hand, I once bought cheap printed flannel plaid for a nightgown and discovered that it was printed off grain, so it was possible to make perfectly matched seams on one side but not on the other. Maybe it was hard to fold this material for cutting and make the dots line up. Aside from the question of why this dress has a wide band inserted at the waist, it’s clear that the person doing the alterations had barely enough material for the band — not enough to match the dots and line them up inconspicuously. In fact, the stripes on the dress run vertically and those on the band run horizontally. It’s made from scraps. On each side, the armhole was made larger and a patch was placed underneath. The repairs to the sheer ruffle are not symmetrical. Did one side tear? Presumably there wasn’t enough fabric to match the pattern — or the person making the alternations wasn’t skilled enough to try (these are very large patches, secured with another line of large hand stitches. I’m not belittling the people who made and altered this dress. I’m suggesting that they did not have the luxury of perfectionism. They had to make do with what they had, and I think that whoever owned this dress, new or second-hand, had to wear it and hold her head high. Poverty limits choices. The front of a long dress with fitted bodice and many patches. Perhaps the most striking thing about this dress is that the patches accumulated over time. It appears to be patched with scraps of the original fabric, but the dress, the large patch, and the smaller patch are not faded equally. The fabric is lightweight, so the cream colored bodice lining contributes to the impression of fading there, but not on the sleeves. How I wish I had had a mannequin available, and the time to photograph the back and the interior structure. The back seams would tell us something about the date when it was made. The waist seems to be cartridge pleated, but, again, I have no photo of the construction. The shoulders don’t look dropped, but it’s hard to tell on a big, padded coat hanger! The neckline is crudely done, using fabric that matches the band on the skirt. The hem is very worn, and the fabric at the shoulders is faded and worn through in one place. You can see characteristic Victorian bust darts which are not covered by the dark patch. But the dress is a mystery as to date, especially because, if it was made and worn by a rural woman, she could have been using a much older dress as her only guide. Machine stitched or hand stitched? Or both? I don’t know. Someone may recognize the fabric, or be able to date the dress from old photographs — for me, it’s a nagging mystery — and I wish I knew about the woman who wore it. To me, the dress says that she was strong and brave while enduring years of hardship.